"When I was eighteen, Uncle Sam told me he'd like me to put on a uniform and go off to fight a guy by the name of Adolf. So I did." 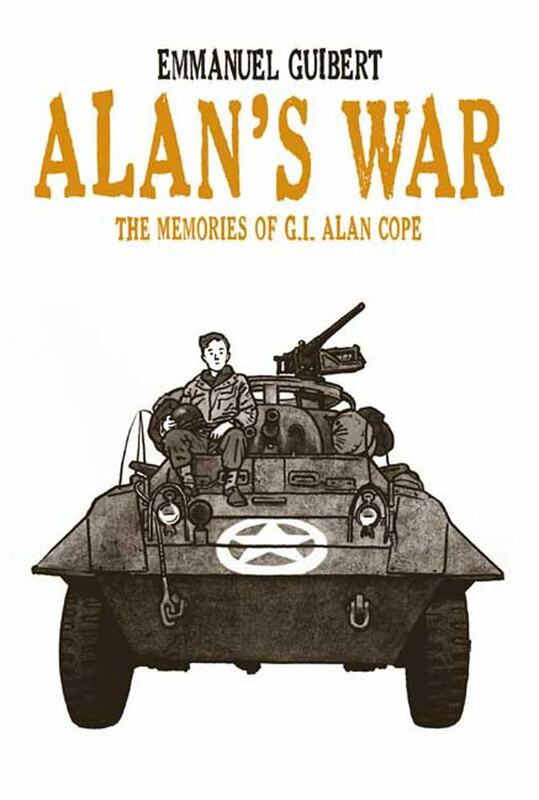 When Alan Cope joined the army and went off to fight in World War II, he had no idea what he was getting into. 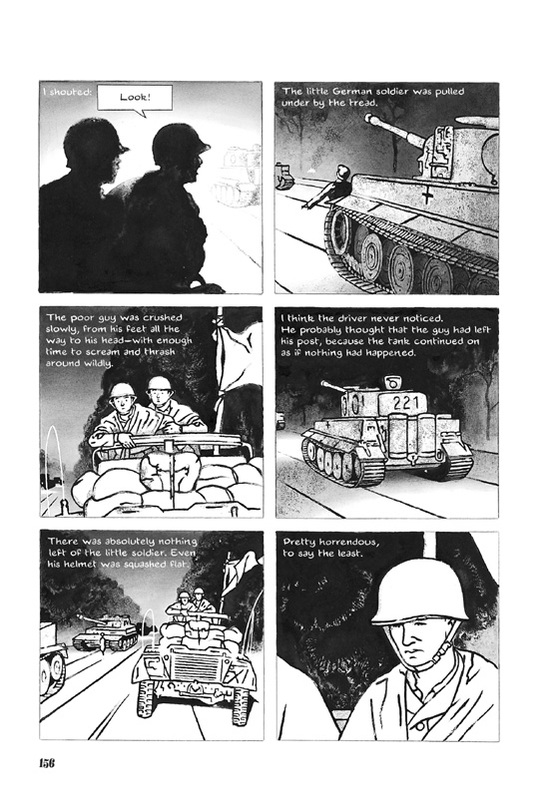 This graphic memoir is the story of his life during wartime, a story told with poignant intimacy and matchless artistry. Across a generation, a deep friendship blossomed between Alan Cope and author/artist Emmanuel Guibert. 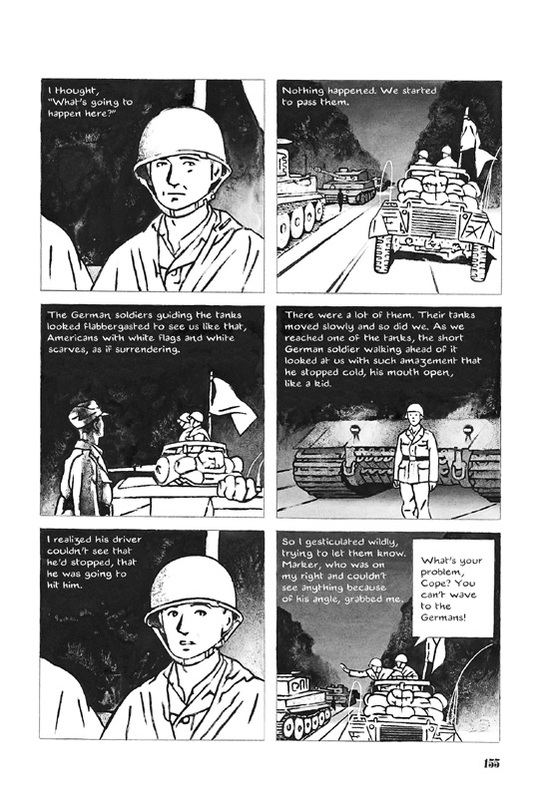 From it, Alan's War was born – a graphic novel that is a deeply personal and moving experience, straight from the heart of the Greatest Generation – a unique piece of WWII literature and a ground-breaking graphic memoir. 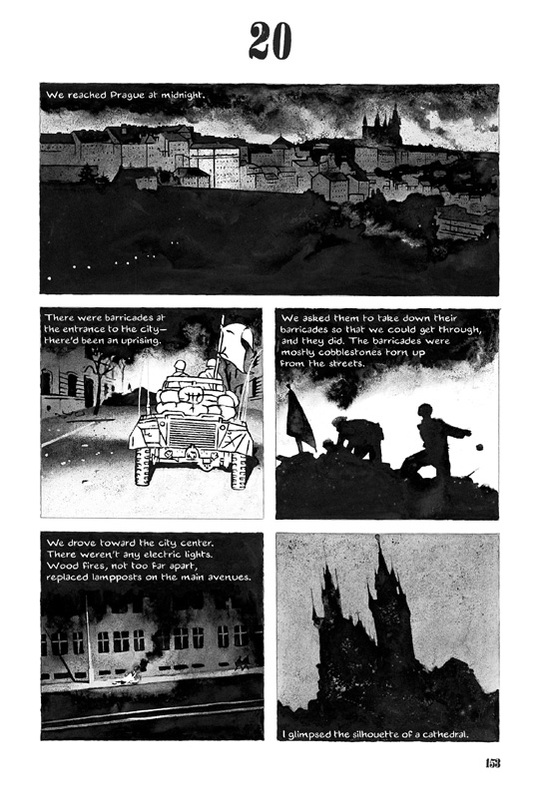 See how Emmanuel Guibert created the art for his graphic novel ALAN'S WAR. “This epic graphic memoir spans oceans and generations, with a narrative as engrossing as the artistry that illustrates it. In his preface, renowned French graphic novelist Guibert (co-author: The Professor's Daughter, 2007, etc.) explains the bond he shared with the much older Cope, who had served as an American soldier during World War II and left his native country to return to France in the aftermath. "He spoke well; I listened well," writes Guibert. "Save two or three, his anecdotes were nothing spectacular. They evoked only very remotely what movies or books about the Second World War had taught me. Still, I found them captivating, because of the accents of truth they contained. I could literally see what he was describing." Now the American reader can as well -- (the first volume of the collaboration was initially published in France in 2000, the year after Cope's death). As the title suggests, this is one man's war memories, filled not with tales of larger-than-life heroism but with the chance encounters, tragic absurdities and small kindnesses experienced by a sheltered young soldier of uncommon intelligence, as recollected by an older man who has come to take stock of his life and reconsider the values by which he has lived it. He comes to question himself, his country and humanity in general, while retaining a humanitarian warmth and a deep appreciation for the arts. The narrative voice is captivating, and the black-and-white illustrations are often stunning, whether capturing the grandeur of Big Sur and the giant redwoods of California or showing the destruction of European villages by soldiers who shared a common bond of humanity with the civilian "enemy." The Veteran's Day publication befits a volume that underscores the resonance and legacy of war. “In 1994 a chance meeting between comic artist Guibert and an American expatriate living in France, Alan Cope, sparked a friendship that continued until Cope's death in 1999. 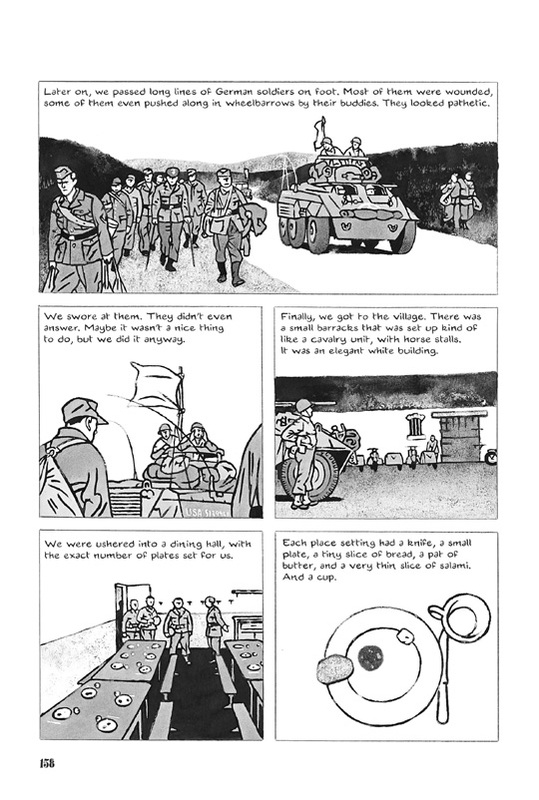 During that time Cope shared the story of his experiences during and after World War II, and Guibert added illustrations to those tales. The result is this volume, a comic memoir of a man's life. Unlike so many memoirs, Cope wasn't unbelievably famous or heroic or, frankly, much more than ordinary, and therein lies the magic. 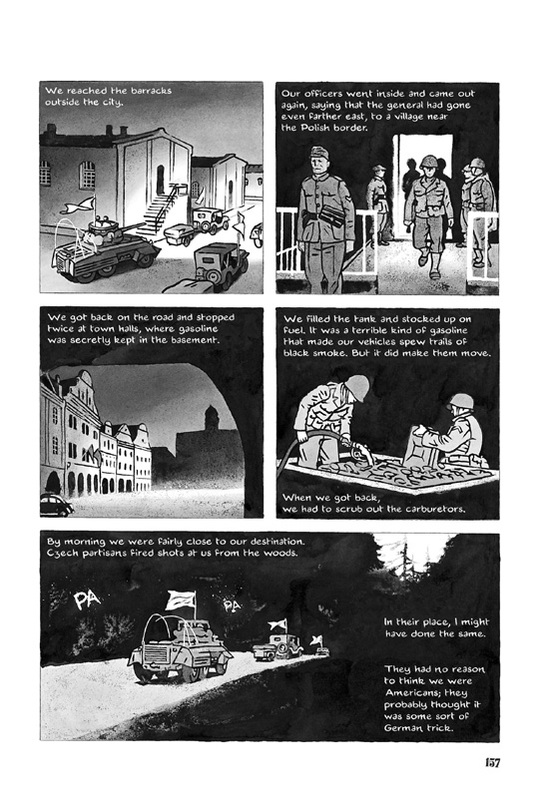 “Relating the experiences of Alan Cope as a graphic novel memoir, Guibert (Sardine in Outer Space) adopts a conversational tone that makes readers feel as if they are overhearing the G.I. 's memories of World War II, both humorous and poignant. Guibert met Alan Cope "by chance" in 1994, when the former G.I. 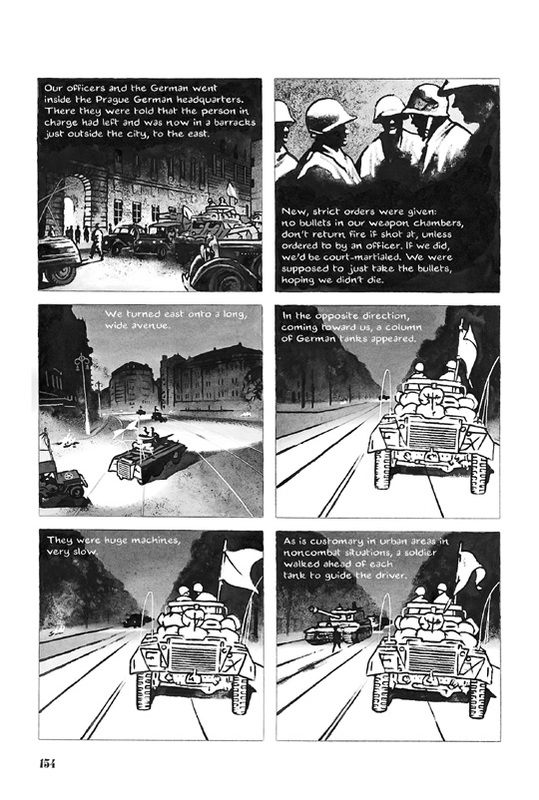 was 69 and Guibert was 30, and Cope began to relate his experiences to the graphic novelist. We watch Alan grow up on the page just after he is drafted in 1943 at the tender age of 18. Having only ever ridden a bicycle, the first thing Alan learns to drive is an army tank. 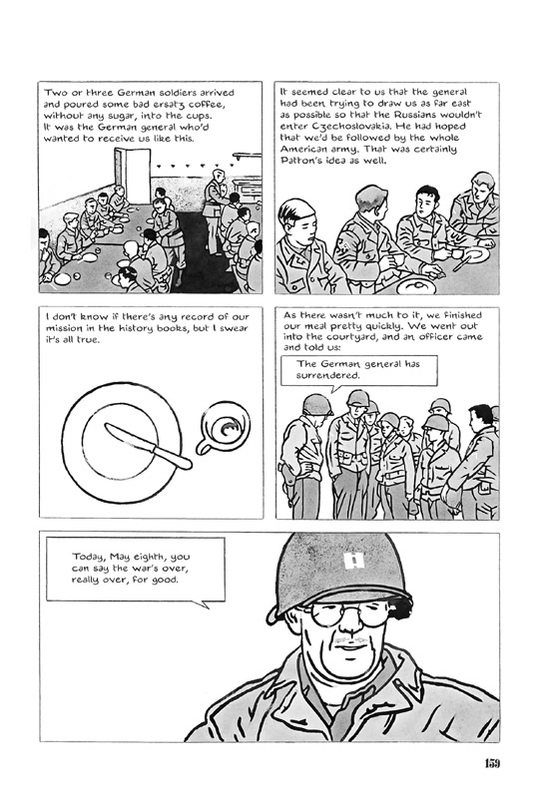 Elements of the book may remind older readers of Catch 22, as when Alan's crew must wait two months after their arrival in Europe because the army has "misplaced" their weapons and vehicles. Emmanuel Guibert has written a great many graphic novels for readers young and old, among them the Sardine in Outer Space series and The Professor's Daughter with Joann Sfar. In 1994, a chance encounter with an American World War II veteran named Alan Cope marked the beginning of a deep friendship and the birth of a great biographical epic. Another of Guibert's recent works is The Photographer. Showered with awards, translated around the world and soon to come from First Second books, it relates a Doctors Without Borders mission in 1980's Afghanistan through the eyes of a great reporter, the late Didier Lefèvre. Guibert lives in Paris with his wife and daughter.